In the heartland of Connaught, a forgotten landscape is being brought to light in the Cruachan Aí Heritage Centre. 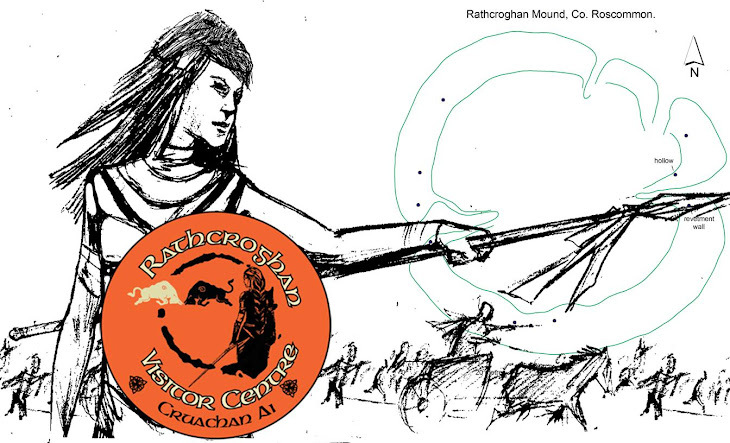 Cruachan is one of the most important and best preserved Celtic Royal Sites in Europe, and the medieval village of Tulsk, Co. Roscommon is the setting for this award winning centre. An amazing array of archaeological remains are located within a four mile radius of the centre, dating from pre-Stone Age to the historic period, and these are interpreted in our bright, modern exhibition rooms. The legendary Cruachan was a Royal Palace, home of Medb (Meave) "she who intoxicates", Warrior Queen and Sovereign Earth Goddess. Fierce and proud, she was responsible for launching the famed Cattle raid of Cooley, as recounted in one of the greatest works of early Irish literature, the Táin Bó Cuailnge. Cruachan was also the inauguration site and burial place of the Kings of Connacht, and location of one of the three famous feiseanna of Ireland. 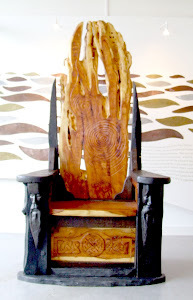 Those of you who are interested in Ireland's rich and diverse Heritage, Celtic Culture, Medieval Discovery, the O'Connor Clan, Geneaology, County Roscommon and the Province of Connaught/Connacht, Ireland's (and possibly one of Europe's) longest and oldest complete epic tale - the Táin Bó Cuailgne or Cattle Raid of Cooley, and the greatest Celtic Warrior Queen/Goddess of Sovereignty that ever lived, Medb (Maeve or Maedbh). .:. Café on Site .:. O'Neills Café is set in a delightful, bright area of the centre serving a wide variety of teas and coffees. Open daily from 10am, serving delicious soups, rolls, sandwiches, salads and breakfasts as well as full meals. A selection of freshly baked scones, cakes and pastries are also available. The café provides a perfect place in which to relax and watch the wild ducks glide along the Ogulla River. Ideally located on the N5, Dublin to Westport, National Road. Conference facilities are available for small to medium sized groups. A fully serviced reception and our dedicated team of staff are available especially to provide you with all the assistance you need to achieve the very best for your business or private event. The conference room can be set to your specific requirements. Cruachan Aí Conference room is also suitable for training courses and enjoys a quiet location. An alternative room is available for group work. Rates are per hour, half day or full day. Larger receptions and launches can be accommodated in our permanent exhibition galleries and auditorium overlooking the river and own private terrace. Excellent in house catering is available through the restaurant, which can provide beverages, an assortment of light refreshments, buffets and meals to suit the occasion.